During September 2007 I was able to realise a life long dream to travel on a photographic safari in Africa. For 11 days Kashuma, our African driver/guide, drove myself and my wife in a 4 wheel drive vehicle through Tarangire, Lake Manyara and Serengeti National Parks and the Ngorongoro Conservation Area in Northern Tanzania. Along the way we were able to see and photograph a large variety of African wild animals and birds. A few of the many photographs we each took are reproduced on this website. Click on the links below to view and hopefully enjoy these images. 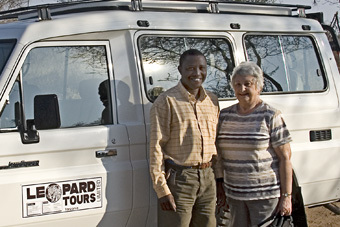 Driver/Guide Kashuma of Leopard Tours. His professionalism, knowledge and driving skill made for a memorable trip.